With aisle after aisle of colorful squeakers, balls, ropes, and stuffies, it’s hard to figure out exactly which toys will make your dog go gaga. According to the report, the perfect toys should be soft, easily manipulable, chewed easily, and make a noise. But researchers at the University of Bristol’s Veterinary School seem to have figured out the formula for the perfect dog toy. The study, which is published in the distinguished animal behavior journal Animal Cognition, reveals the science behind why some toys become Fido’s favorites while others collect dust in the toy box. The answer may lie in the habits of the domestic dog’s closest ancestor — the wolf. Researchers presented dogs with a different toy for 30-second intervals until the dog stopped interacting with that toy, indicating that the dog’s interest had waned. The team used a wide variety of toys in different colors, odors, and materials, and made sure that each successive toy was a unique one that presented a contrast from the toy that came before. 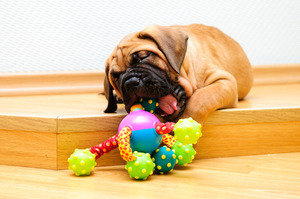 While there was no single characteristic that made one toy preferable over another, the study revealed that as a dog gets used to the stimulus qualities of the toy — its smells, texture, and sounds — the dog is likely to grow bored with that toy. Most of the new toys presented by researchers seemed to incite intense but temporary interest in the Labs, the researchers say, perhaps because it is instinct for canines to investigate unfamiliar items. “Dogs quickly lose interest in toys with hard, unyielding surfaces, and those that don’t make a noise when manipulated,” Pullen added. Because dogs can quickly become habituated when it comes to toys, the best thing an owner can do to spark interest in their pooch is to get involved and play, too. The researchers all agreed that dogs make such wonderful companions because they never lose the desire to play, even as adults. Many other animals only engage in play when they are young and grow out of the behavior as they age — but not the domestic dog.